Spinner dolphins have many interesting relationships with the organisms that surround them in their habitat. They can serve as prey for many larger mammals, as well as a predator for some of the smaller creatures of the ocean. Shrimp, squid, many species of fish, and some other small animals are the main components of a dolphin's diet, whereas Killer whales and sharks are great examples of a common predator to these Spinners. 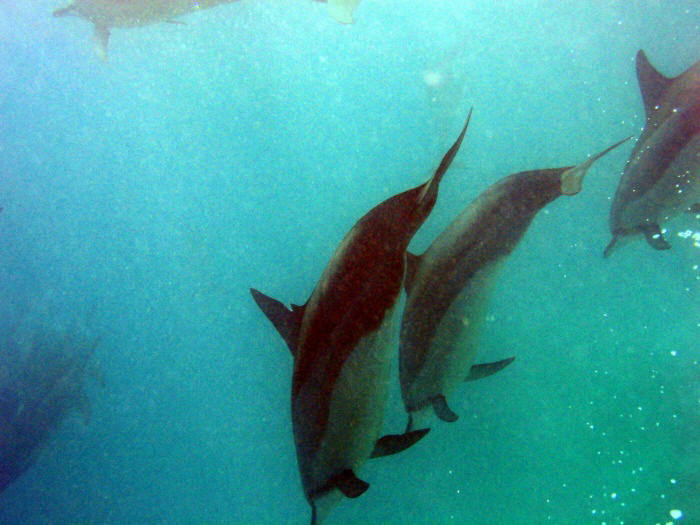 In some areas, these dolphins have been seen interacting with Spotted dolphins. By integrating into one large group, some of the mammals were able to rest while the others were on the lookout for predators. A certain species of fish, Remoras, have a mutualistic relationship with Spinner dolphins as well as many other marine mammals. These fish grasp the mammals to get a free ride to a new location, while providing no harm in return. On the other hand, there are some parasites, such as trematodes, cestodes, nematodes, and acanthocephalan worms that have been found on and in spinners. These organisms can potentially seriously harm the animals. The Stenella longirostris has had many effects on humans for many years. Dolphins have been held in captivity for various reasons, such as entertainment, education, and research. Entertainment by dolphins is now a multi-million dollar industry in the United States and people travel from far and wide to see these talented dolphins perform. This particular species of dolphins have not been used as much for entertainment as other species, such as the Bottlenose dolphin, but have contributed greatly to education and research of scientists. Not only are these mammals used in captivity, but they have also been used in their home environments to assist the United States military in locating weapons and aiding in other related tasks. Many of these animals have been used for food in various parts of the world as well, but those numbers seem to be decreasing as the years go on.